Want to give mom the perfect gift for her birthday, anniversary, or Mother's Day? The Personalized Family Heart Pendant with CZ Birthstones is a truly stunning piece of fine jewelry craftsmanship. 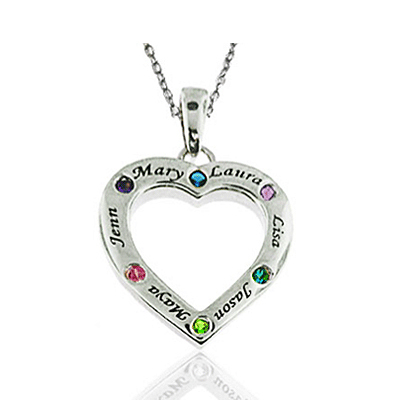 Add up to six names of six letters each and accompanying birthstones which will be engraved and set into the heart shaped pendant. The simple silver pendant is elegantly shaped and styled and lets the names and stones be clearly seen. Its modest size lets the names be seen easily while keeping the pendant small enough to be worn with any outfit or look and enjoyed all day, every day. Keep your family close to your heart with this pendant! Names can be up to 6 characters per name including numbers and keyboard symbols. Pendant comes with an 18" chain. We guarantee our Personalized Family Heart Pendant with CZ Birthstones in Sterling Silver to be high quality, authentic jewelry, as described above.